Motherwell FC Community Trust amateurs show off the first trophy they have won since forming in 2012. Motherwell FC CT beat Premier Division side East Dunbartonshire to lift the Tommy Marshall Trophy at James McGrory Park in Glasgow. The game did not start particularly well for ’Well, with East Dunbartonshire taking control from the off. Some excellent football and pace in the wide areas was causing problems and Stuart Leishman had to be alert in the ’Well goal to keep out a couple of early efforts. ’Shire continued to press and eventually got their breakthrough with 20 minutes played, when a flowing move down the left led to the ball being cut-back to the edge of the box for an onrushing midfielder to coolly slot into the corner of the net. At the other end, Ross Miller and Billy Tweedie were trying to cause some problems of their own, but ’Well were struggling to create any real chances. With half-time approaching, ’Shire created their best chance to double the lead when their striker raced onto a ball over the top, but only found the inside of the post. After the break ’Well went about stamping their authority on the game with Miller and Tweedie both testing the ’keeper. With an hour played, the ’Well pressure did pay off and they were level as a through ball from the right wing by Chris Sinclair found TWEEDIE arriving to calmly lift the ball into the net. In 75 minutes they took the lead as a ball into the box from Sinclair wasn’t properly cleared and LJ Rennie was able to keep it alive and find Miller with his back to goal on the six yard line. The striker did well to hold off his marker before rolling the ball back to the penalty spot where KEVIN TOTTEN was waiting to slot the ball in. With a lead to defend, ’Well adopted a more defensive approach for the final 15 minutes as East Dunbartonshire went looking for a way back into the game. However, they were kept at arm’s length as the final whistle sounded to confirm the club’s first piece of silverware in their three year existence. 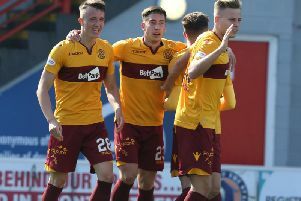 Motherwell FC CT will play in the Strathclyde Saturday Morning Amateur Football League’s Premier Division next year after they followed up their impressive cup final win by clinching promotion. In a competitive Division 1, ’Well confirmed their place in the top league after finishing runners up to champions Maryhill Blackstar, the club’s second promotion following their formation in 2012. ’Well striker Ross Miller capped off a successful season as he picked up to two individual awards at the Scottish Saturday Morning Amateur Football league’s annual presentation dinner. Miller picked up the Division 1 top goalscorer award, while he was also named in the Division 1 team of the year for the second successive season.